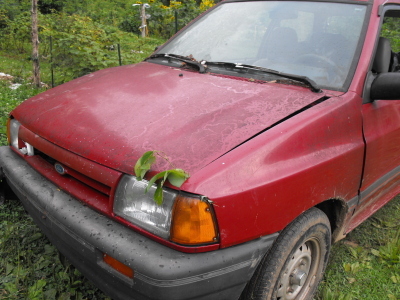 I decided our driveway was in a good enough state of dryness to see if the parts Festiva had what it takes to help tow out the golf cart for some expert repair. It only got stuck once, which was quickly fixed by modifing the ruts to fit the bigger wheel base. I'm pretty sure this is a once a year opportunity and when the rain kicks back to a more regular schedule the flood plain will earn its name back. In the meantime it's nice to have a back up to our much valued golf cart.